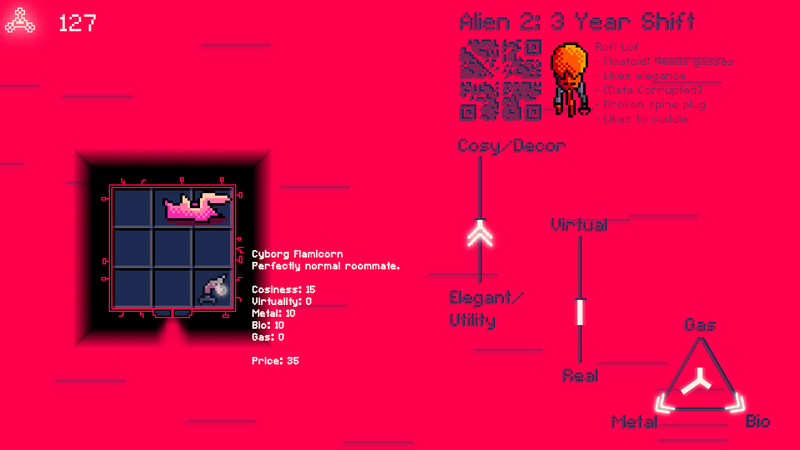 Precursory AI decorator sim-environment, assumed to be created during the 48 standard hour event known as Global Game Jam 2019. 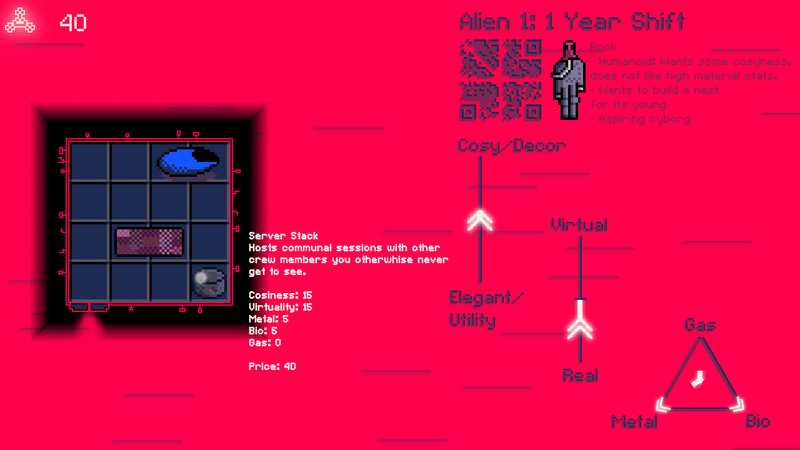 Your purpose is to select furniture for the alien assets aboard [factory_ship_id]. As agreed in [subject_contract], assets can only receive one piece of furniture per standard year. As agreed in [subject_contract], assets will not be allowed to choose furniture themselves to ensure maximum efficiency, compliance with ship regulations and compliance with general system law. Your task is to read asset bios, determine their preference and select furniture that makes them feel "at home". 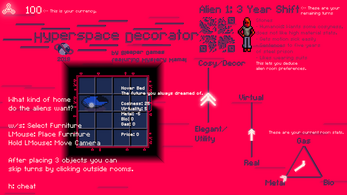 You will select the correct room furniture in regards to [room_stat_ cosiness], [room_stat_virtuality] and the material components [room_mat_metal/gas/bio]. Your performance will be evaluate at the end of asset work shifts. Increased productivity due to adequate accommodation will result in more funds allocated to your on-board replication facilities. Up to  pieces of furniture objects will be made available for printing after completing work shifts. [contract] will be expanded to allow employ of up to  alien species. 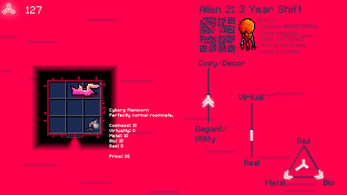 Room size will also increase as seen fit by [accommodation_overlord_mind]. Reduced productivity due to failing to provide ample decoration will encure a penalty. If your funds are depleted after a shift-end review you will be replaced by a more efficient decorator AI. Insert [complementary_encouragement_phrase] of your own preference. 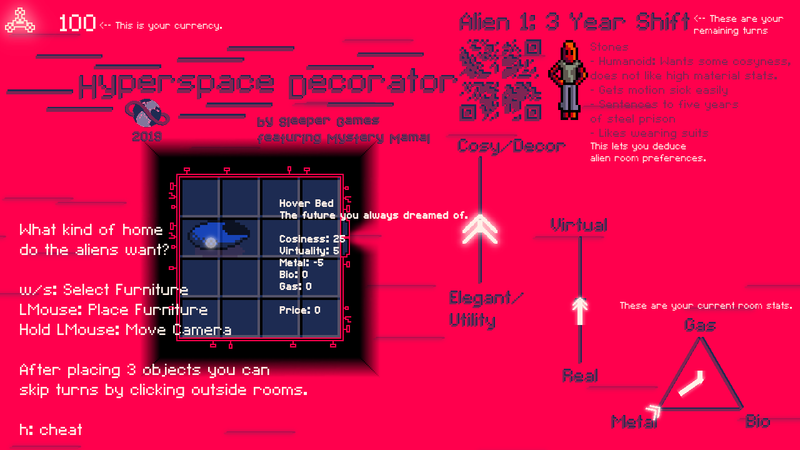 [creator_reference_appendum]: Not really happy with how this game turned out, but it got quite a bit of content and complexity to it so I put it up regardless. The UI is still messy at times and the economy might be a tad unbalanced. Feel free to leave feedback. 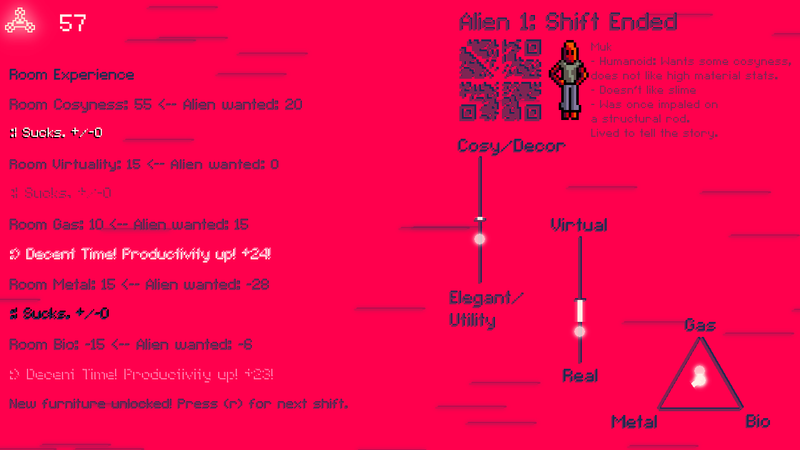 Writing the alien quirks and spiriting the furniture was fun, other than that I spend half the time with working on the UI and it didn't even turn out good. :o If you want a better jam game play my last years entry. :p I like that better at least.